RUSH: So just to illustrate my theory yet again, we have more proof — more evidence here — that the theory is correct. If the media is coming up with the talking points, the media is the one strategizing, the media is in the lead position. This is last Thursday and Friday. We have a media montage once again in which the theme is “crisis of credibility.” This happened on Thursday, after a White House press briefing, and some news about Comey and the firing. The immediate take was “crisis of credibility” coming out of the White House. This montage demos it. CHRIS CUOMO: (swoosh sound) The Trump White House is facing a major credibility crisis! JACOB TAPPER: I don’t even know if the White House understands that this is something of a crisis of credibility. DAVID CHALIAN: (shouting) What we have here now is a White House in a crisis of credibility! JOSH EARNEST: …a self-inflicted crisis, and there is a yawning credibility gap. ATHENA JONES: This suggests a real crisis of credibility. BROOKE BALDWIN: It’s a crisis of credibility here. DAVID MUIR: What about credibility here? SCHUMER: There’s a crisis of credibility with the president. 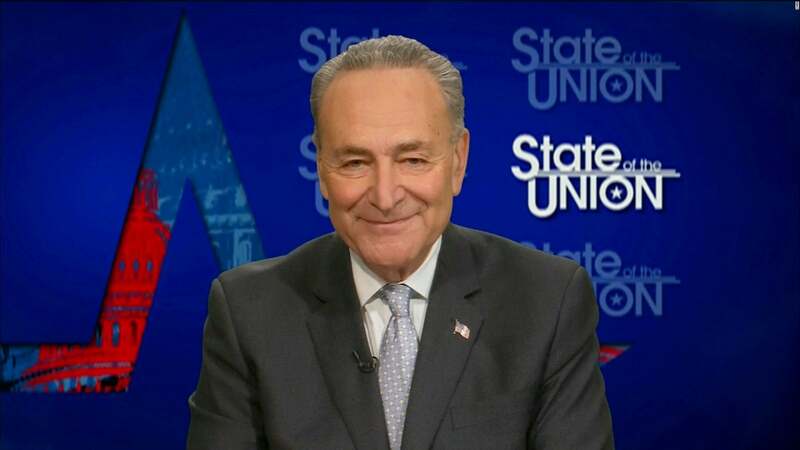 SCHUMER: I mean, so many things! You know, there’s so much factual fabrication and then backsliding and contradiction. We need our Republican colleagues — not every day, but on the occasions when it’s necessary such as for a special prosecutor, such as what’s happened in the last week — to speak out. Because this is country! Our credibility, the credibility of the presidency with the American people and of our country with the world is rapidly eroding because of the crisis of credibility. RUSH: See? Here we go. So the media on Thursday and Friday: “Crisis of credibility! Crisis of credibility! Crisis of credibility!” Schumer on Sunday: “There’s a crisis of credibility here, Jake. It’s a bad crisis of credibility, and we need a special prosecutor.” There isn’t a crime. Nobody can tell you what the crime is. There’s no evidence of anything. What is the crime for an independent counsel to investigate? Okay, so that’s one example. Let’s go back. A new media montage that we put together from yesterday and this morning. We’ve got people from CBS, CNN, the Washington Post, Fox News, ABC — and the new mantra is Trump obstructed justice. BOB WOODWARD: Some people are saying it’s part of the obstruction of justice. CHUCK TODD: …accusations of obstruction of justice. LAURENCE TRIBE: That’s obstruction of justice! EUGENE ROBINSON: …obstruction of justice! NEERA TANDEN: …what most people would consider obstruction of justice. JEFFREY TOOBIN: He did it for a reason that was very similar to the Watergate cover up, which is that he wanted to stop an FBI investigation. That’s an obstruction of justice. RUSH: He didn’t want to stop an FBI investigation! Trump thought the Democrats would be in love with him for doing this. But, anyway, that’s another point. “Trump obstructed justice! It’s an obstruction of justice! That’s obstruction of justice!” All of these people say it, and not one Democrat in this montage. Not one elected Democrat. And that’s from yesterday and this morning. It was Jeffrey Toobin here at the end. “He did it for a reason that was very similar to the Watergate cover up, which is that he wanted to stop an FBI investigation.” That’s… Jeffrey Toobin, you can’t really believe that. You’re not that vacant or vacuous. Stop the investigation? There’s an investigation in the House; there’s an investigation in the Senate. The FBI investigation is ongoing, as McCabe said. Yet there they are saying that Trump wants to stop the investigation, that’s why he fired Comey. He fired Comey in part… Comey should have been fired last July. You know the next time Comey should have been fired? His recent congressional testimony where he acknowledged that leaks are occurring and that they’re very bad but he had no interest in pursuing them. Leaks are criminal! He had no interest in pursuing them! Leaks from the deep state, leaks from within the administration. “Nah, not interested. We don’t go after the press here at the FBI.” You’re not interested in pursuing real crime? You want to pursue something where there is no crime? So he should have been can. But Trump literally thought that the Democrats were gonna love him. He thought he was giving them something they desperately wanted. Now, this tells me that Trump’s not being well served by the people around him. If that was his idea and he expressed it to staff, there should have been somebody say, “Mr. Trump, no, no, no. That’s not gonna be the reaction here. If you’re firing Comey because you want to score points with Democrats, that is not going to happen.” That’s troubling to me, folks. I mean, we supposedly have Wizards of Smart surrounding Trump. We’ve got people here, people there. I don’t think we have… Based on what I’m seeing, I don’t think there’s anybody in there who really understands what they’re up against. They think it’s just standard, ordinary, everyday political opposition ’cause that’s how Washington works. I don’t think they really understand. “You may be think that’s impossible, Rush. Of course they understand it. They’re the victims of it; they see it every day.” Not sure, folks. I mean, if you think firing Comey is gonna get you accolades and praise from the Democrats, either somebody’s misinforming you on your staff or you’re not seeing it correctly yourself. SCHUMER: Well, look, uh, obstruction of justice is a very complicated issue. It involves intent. Uh, I’ve asked for and our Democrats on the Judiciary Committee have asked for the inspector general to do a complete and thorough report about anyone — anyone at all — interfering with this investigation. Once we get those facts, we can then consult some of the great legal minds and, uhh, come to a conclusion. Not the right answer. Not the right answer. The media set this up. He was teed up and Schumer blew it. Further evidence my friends here that it’s the media driving all of this. Here is more absurdity. Laurence Tribe, this is the Harvard Law professor that liberal Democrats have dreamed of being a Supreme Court justice someday, Laurence Tribe, they have had dreams, they have had so many close calls. They have loved Tribe. They have desired that Tribe be on the court someday. He’s so brilliant, he’s so smart, he’s so one of us. TRIBE: This guy does a lot every day, as he reminds us, he is basically a loose cannon. And with every passing day he rolls around the deck and blows holes in the ship of state. The Constitution doesn’t give him the right to offer the director of the FBI a deal, a rather sweet deal. You want to be reappointed? Well, I think I’ll reappoint you if you lay off on your Russia investigation. That’s called a bribe. And the Constitution is absolutely clear. It says, the president and vice president shall — not may, but shall — be impeached, convicted and removed from office for committing a bribe or other high crimes and misdemeanors. RUSH: This is so off its rocker. He wants to impeach Trump now before we find any evidence. There isn’t any evidence of anything, but we’ve gotta impeach Trump. This is a bunch of people coming unglued.